Perform text recognition / OCR. Works with Adobe Photoshop and Illustrator (CC 2017 or newer). Requires to enter a prepaid code created by Krasbit. This is recommended option for fast, easy and free start that will let you examine extension. Trial code may be automatically created for your device so you can use WEB DETECTION, TEXT DETECTION, DOCUMENT TEXT DETECTION features limited in time and quantity. Once your trial code is used or expired you can easily order another code via Adobe Exchange marketplace and get it into your email just after successful payment. Authentication is based on API key / access credentials created in advance at Google Cloud console by end user. This option is suggested for advanced users that already have Google Cloud account, then billing plan and Vision API enabled. It is also cost effective in case of expected high volume of API requests. 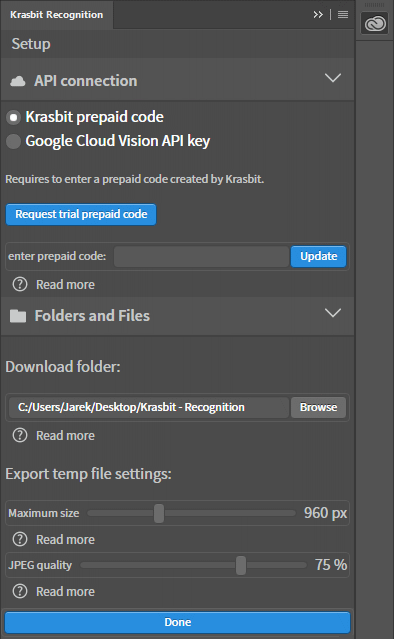 Krasbit API service works like a proxy that redirects requests between extension and Cloud Vision service. Thus Krasbit is billed by Google for use of service. You need not to worry about unexpected costs or struggle with cloud vision console administration. In this mode, Krasbit Recognition extension directly communicates with Google Cloud Vision service. Krasbit Prepaid Code means for you a fixed and clear costs as you are purchasing limited amount of feature requests that should be used within given time. There are several prepaid plans that are available to buy at FastSpring or Adobe Exchange. Each of them consists of different quantity of available requests per feature. There are also different expiration dates till you can use your code. Prepaid code is generated and sent to user’s email after purchase. Please visit Google Cloud Vision API site in order to get information about pricing and limits that user pays on it's own to Google. First 1000 units/month are free of costs but enabling billing plan and configuring payment method is required anyway. Visit Krasbit at FastSpring or Adobe Exchange to get the recent price and features amount limits. Controlled by end user’s billing plan. Prepaid code may be used or shared to multiple computers / users at will. Pay attention that each feature request with use of given Prepaid Code will be counted and deducted from your initially available quantities. API Key may be used or shared to multiple computers / users at will. Pay attention that each feature request with use of given API Key will be counted by Google and bill will apply at monthly basis depends of requests quantities. Which API connection option should I chose? You can select (limit) detection features that you would to run for your working document. searching for exact copies of your project or images similar to yours over the web. analyze the content of your project and suggest the keywords list that might recorded with your image and used later in search by stored metadata. This will perform a simple text detection on your image. That option is designed for detecting individual words that may be hand written and rotated. May not be accurate for large block of texts or tiny text but on other hand is cheaper and less computing expensive. You can have selected Text Detection or Document text detection / dense text OCR but not both at same time. If you are not sure which one is good enough for your case, try to start from Text Detection. If results are not accurate, switch to advanced and more expensive option - Document text detection / dense text OCR. This exemplary image is used to present the results of the Krasbit Recognition script running at Adobe Photoshop application. Click Start button to initialize detection process. You will need an internet connection available to process. It may take some seconds to export temporary image, sent it to cloud for analysis and parse response. Depends of your initial choice of features - you will get all or only a subset of accordion sections representing analysis results: Keywords, Web images detection, Text detection. This section will show you a suggested keywords / descriptions for your image as interactive items. You can click on desired items to be transfer them into document’s keywords. This may help you later to search or filter images by any software capable to work with keywords like Bridge or Lightroom. This section will show you list of keywords that are already assigned and stored inside your document. You can review them and click on desired items in order to remove them. Partial - represents images that are identified as a partial copy of your opened document. It means versions that are cropped, rotated or altered geometrically. You can use filters and limit displayed results only to desired strength of similarity. Use Full, Partial, Similar checkboxes to control visibility of related thumbnails. Notice: in case of image url that contains no filetype extension - image will be opened in browser instead because host app could not determine type of image upfront and open it properly. You may open images in system’s default web browser at origin website. This list shows each detected word individually. You can click desired on desired words in order to place it into your document at given location and rotation angle. Your application foreground fill color will be used as color for imported text. This text area will show you all words detected in your image as single block of selectable text. You can copy/paste desired content and use on your own. This panel lets you track usage of certain features. Every time you click Start button and receive response from service - your currently selected Recognition features will update(increment) theirs local counters. This may help you determine usage of features per computer in case you are sharing your API access code on multiple desktops. Use this button to reset counters to 0 for each Recognition feature.